Gabriel and Tyler victorious claiming the Quiksilver and Roxy Pro France in clean four-to-six foot waves at Culs Nus. Gabriel Medina (BRA), 21, reigning WSL Champion, and Tyler Wright (AUS), 21, have emerged victorious this afternoon, claiming the Quiksilver and Roxy Pro France respectively, in clean four-to-six foot (1.5 – 2 metre) waves at Culs Nus. Stop No. 9 on the 2015 Samsung Galaxy WSL Championship Tour, the Quiksilver and Roxy Pro France, delivered a week’s worth of the world’s best surfing, with the WSL elite and the classic Autumn conditions combining for a high-performance surfing extravaganza. Medina, who claimed his maiden CT victory in France in 2011, was dominant throughout the 35-minute Final, blasting the clean righthanders with speed, power and progression to post a 17.50 out of a possible 20 and claim an emphatic win. The victory sees Medina move up two places to fifth on the Jeep Leaderboard. Durbidge, whose form throughout the 2015 Quiksilver Pro France was undeniable, found himself out of rhythm in the final heat of the event, finishing Runner-Up for the second time this season. Durbidge’s French performance moves him to 10th in the world heading into Portugal. Despite an exciting opening heat this morning in which he posted massive scores, Julian Wilson (AUS), 26, was stopped in the Semifinals, lacking opportunities to perform. However, Wilson’s equal third in France provides another excellent result for the Queenslander this season, moving him to 4th on the WSL Jeep Rankings. In an all-Brazilian Semifinal matchup, Adriano De Souza (BRA), 28, seemed in control up until Medina posted his second perfect 10 point ride of the event to turn the table in the dying moments. With a third place under the belt in France, De Souza solidifies second position on the Jeep Leaderboard, well within striking distance of Fanning when the title race resumes in Portugal next week. Tyler Wright (AUS), 21, dominated the Roxy Pro France Final, unleashing her powerful surfing in clean conditions to score two excellent rides including a beautiful forehand barrel and combinations of turns. Her impeccable wave selection left her opponent scouring the lineup for leftovers as Wright milked the longest, cleanest waves on offer at Culs Nus. Wright claims back-to-back Roxy Pro France titles and moves up to 5th on the Jeep Leaderboard before the final stop in Hawaii. Today’s victory marks the Australian’s first CT win of 2015. Tatiana Weston-Webb (HAW), 19, was unable to clinch the win during her first-ever Final appearance on the Samsung Galaxy WSL Women’s Championship Tour, placing Runner-Up to Wright. Weston-Webb, who secured the only perfect 10-point ride of the women’s event in the opening round, found an excellent wave on her backhand for an 8.30 but couldn’t back it up on time and placed second. This marks the young Hawaiian’s career-best result and will propel her to 8th place on the Jeep Rankings before tackling the final event of the Women’s CT in Maui next month. Sage Erickson (USA), 24, couldn’t find the right waves in a shifting lineup in Semifinal No. 1 and placed equal third. 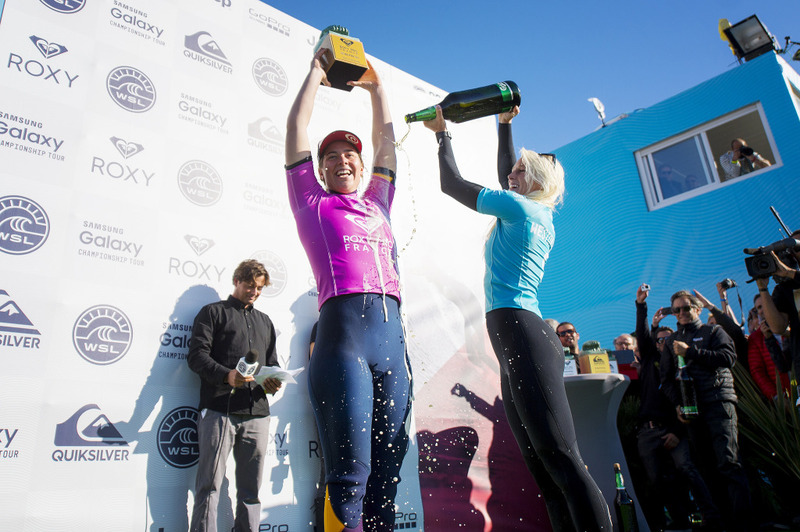 Erickson had an exciting campaign in France up until the semis and previously dispatched World No.4 Lakey Peterson (USA) and reigning 6-time WSL Champion Stephanie Gilmore (AUS). The Californian nets her season-best result so far and will look to keep her momentum going into the final event in Maui newly ranked at No. 16. In the second Semifinal, new Jeep rankings leader Carissa Moore (HAW), 23, had a shocker performance, only able to find two average waves and minimal scores. Despite this Moore was one of the form surfers of the Roxy Pro France and will carry her excellent rhythm into Maui for the World Title showdown. The next stop on the 2015 Samsung Galaxy WSL Championship Tour for the men will be the Moche Rip Curl Pro Portugal from October 20 – 31, 2015 while the women will culminate their season with the Target Maui Pro from November 21 – December 4, 2015. Highlights from the Quiksilver and Roxy Pro France will be available at worldsurfleague.com and via the WSL app.